Greenland Tower Chengdu is a 468m high mixed-use tower designed by Adrian Smith and Gordon Gill. Image: courtesy of Adrian Smith and Gordon Gill Architecture. The tower will have a glass façade that will reflect the street and sky lights, making it appear like a shimmering icon. Image: courtesy of Adrian Smith and Gordon Gill Architecture. The skyscraper is touted to be the tallest building in Chengdu and fourth tallest in China. Image: courtesy of Adrian Smith and Gordon Gill Architecture. The tower design is inspired by the Chengdu’s urban structure, local culture and Chinese feng shui theory. Image: courtesy of Adrian Smith and Gordon Gill Architecture. 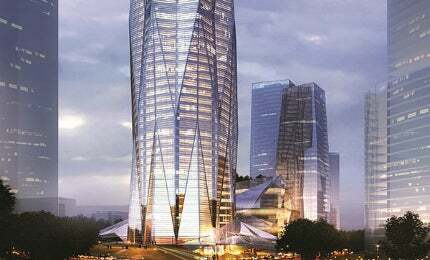 Greenland Tower Chengdu is expected to be completed by 2018. Image: courtesy of Adrian Smith and Gordon Gill Architecture. Greenland Tower Chengdu is a 468m high mixed-use tower being constructed by Chinese property developer Greenland Group. Designed by architects Adrian Smith and Gordon Gill, the skyscraper is touted to be the tallest building in Chengdu and fourth tallest in China. Construction is ongoing on the tower located in the centre of Chengdu’s Dongcun district and is expected to be completed by 2018. Taking inspiration from the ice mountain topography of Chengdu and its surrounding region, the prism-shaped tower is part of a larger project that also comprises two smaller towers and a six-storey podium. The building is designed to accommodate a mix of office spaces, a hotel and a shopping mall in the form of an attached six-storey podium building. Imbued by the Chengdu region, the development is being referred to as a ‘city within a city’. "Shaped like a mountain, the tower will reflect and diffuse light from all angles that has led to the building being hailed as a light sculpture." The tower design is inspired by Chengdu’s urban structure, local culture and Chinese feng shui theory. It’s an amalgamation of the traditional and ancient aspects of the city that are represented in a modern architecture. Shaped like a mountain, the tower will reflect and diffuse light from all angles that has led to the building being hailed as a light sculpture. The angular shape depicts a diamond rising towards the city’s skyline. A large canopy will be present at the ground level covering the walkway towards the building. Spread over an area of 395,305m², the tower will feature the biggest floors in the lower zone that will be occupied by 12,000m² of offices. The middle zone will house a 51,000m² luxury hotel and the premium high zone will be home to 42,000m² of CEO suites. A roof garden offering panoramic views of the city will be built at the top of the tower. The tower is designed to have 101 storeys above-grade and five storeys below, while the accompanying two towers will be 116m and 147m high respectively and provide high-end SOHO apartments. A podium will feature 14,000m² of retail space, a 16,000m² conference centre, an 8,000m² exhibition centre and a bridge that will connect to the main tower. The development is designed to create an environment for a garden city with amenities for vehicular, pedestrian and metro transportation. Hanking Center Tower is a 350m-tall mixed-use building that is under development on Shennan Boulevard, in the Nanshan district of Shenzhen, China. The tower’s façade will be covered with glass panels that will reflect the street and sky lights giving it the appearance of a shimmering icon. LED luminaires will be fitted on the façade and beneath the architectural reveals along the angular surface of the structure. Activated at night time, the reveals will glow in white and blue. Peaks and valleys of the façade will be highlighted through a light control system that will work towards producing a spectacular play of light on the tower’s glass exterior. A unique feature of the tower is the seamless fusion of its architecture and structure. Located on a high seismic zone, the building structure uses a geometric plan and features triangular shapes that act as diagrids, resulting in a sturdy frame. The tower’s tapering form and high-performance damper bracing system add to the building’s stability by deflecting wind. For the first time in China, a high-rise building is being constructed with a core wall and sloping walls. The tower’s main lateral force resisting system will comprise a steel reinforced concrete core wall with 16 steel reinforced concrete columns winding along its height. A brace frame system consisting of steel-reinforced concrete columns with steel beams on the outside will make up the second lateral. Water will be harvested by a condensate recovery system that will benefit from Chengdu’s hot and humid climate. Other sustainable features of the building include an air filtration system and a fully glazed façade that allows natural light to illuminate the tower’s interiors. Thornton Tomasetti has been appointed as structural engineers for the project and will provide services for the schematic design and design development phases, and structural peer review services for the construction documents phase. Office for Visual Interaction (OVI) will provide the lighting design. Elevator consultants Fortune Shepler Saling has been selected to provide vertical transport for the tower.